Electron beam tomography (EBT) is a specialized form of computed tomography that is designed to obtain better images of heart structures than can be obtained using standard CT technology. In order to capture clear, accurate images of the constantly-moving heart, a CT’s X-ray source point must move extremely rapidly around the patient. In conventional CTs, X-ray tubes spin mechanically around the patient, but simply cannot move quickly enough to prevent blurring of cardiac images. A large, stationary tube that surrounds the patient almost completely is used in electron beam scanners. The tube contains a tungsten anode, along which an electron beam focal point is moved electronically, creating an X-ray source point that can move around the patient at ultra-high speed. In fact, with each target ring sweep lasting only 100 milliseconds, EBT scans are ten times faster than standard CTs. Moreover, EBT synchronizes image capture with the patient’s heartbeat to increase image quality. EBT scanners provide high temporal and spatial resolution, generating exceptionally sharp images. As such, the technology is an ideal noninvasive coronary imaging modality for detecting even minute amounts of calcification in the coronary arteries. Sophisticated EBT software allows coronary calcification to be accurately quantified. In many cases, EBT serves as a safer alternative to invasive angiograms, which require that patients be anesthetized and have dye injections. However, in some cases, an angiogram may be required to assess the extent of arterial narrowing once calcification has been detected by an EBT scan. Company Imatron, which brought the initial EBT platforms to market, was acquired by GE Healthcare in 2001. GE Healthcare subsequently introduced the e-Speed scanner platform, which still dominates the EBT market. While, the platform is no longer being produced by the company, many legacy systems are in active use and are available on the secondary medical equipment market. 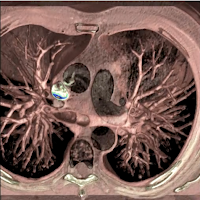 Increasingly cardiac calcium scanning capabilities are being integrated into DSCT and 64-slice MDCT scanners. However, initial studies indicated that EBT scanners generate significantly less artifact in calcium scans than the other platforms.